The Claudio Arrau 80-CD box arrived! Limited Edition, Decca 483 2984, 80 CDs plus large color booklet with all particulars and photographs. Yes, I broke down and decided to acquire this even though I already had so many of the Philips and later Decca reissues. There was much I did not have, too, however. This fills in the gaps. It is a beautifully put-together tribute to the pianist in a large box with four separate compartments housing the good-quality cardboard cases, well numbered and marked. Full recording details are in the accompanying book. The box is designed very much in the manner of the one produced for Alfred Brendel. The problem with Brendel is they are now issuing additional material from live concerts that are not included in the mega-box. Arrau has been gone now for quite awhile so he is, obviously, no longer contributing to his discography (of course!). Incidentally, the price has already gone up $17 USD since it was first announced on Amazon and it will no doubt rise in price even more. 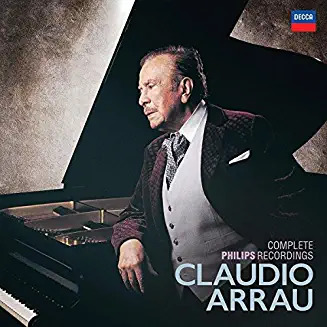 If you have this new Decca box, what EMI/Warner has put out, and RCA/Sony Classical, plus all the private material that has been issued on smaller labels, you will have quite a collection in following Arrau's career from the beginning days on discs to his final days. 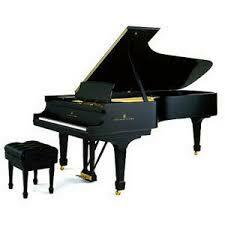 Of interest to me is the fact that all his American Deccas uses a Baldwin concert grand piano. Baldwin was largely responsible for launching Arrau's career. He switched his allegiance to Steinway once his career took him international. Fewer fine Baldwin concert grand pianos were available outside the USA and Canada while Steinway had a presence in Germany shipping their pianos to England and all over the world outside the USA. Now German Steinways are imported into America. Many artists prefer them to their American counterpart. Re: The Claudio Arrau 80-CD box arrived! I've just acquired this, but the cellophane is still on. Fact is, 80 CDs are a bit daunting, and I'm caught up in the Christa Ludwig edition (12 CDs). From my first classical music days, I've held Arrau in high esteem. I said elsewhere that I think his interpretive seriousness, restraint and nobility makes much of his music sound like Beethoven - especially his Chopin - but I don't mind that. If he sits behind Rubinstein and some others in this repertoire, I am still delighted to have his accounts. I am looking forward to comparing his two sets of Beethoven piano concertos, among other treats. PS, that's very interesting about the pianos, Lance. I will listen carefully for that. How would you describe the difference in sound from Baldwin to Steinway? Arrau's 1950s recordings for American Decca with the Baldwin are in mono only, of course. But as I recall from the LPs, it was a very fine sound. They won't have the presence of a stereo recording as offered in the Philips recordings, but still are excellent. In the 1950s, Baldwin had a rich sound, especially in the bass. I, myself, have to make the A/B comparisons to give you a better reponse to your question regarding Baldwin vs. Steinway. Well, I look forward to that. Do you think mono hides a piano's characteristics? I suppose it depends on the recording - there are some really good mono piano recordings, such as Carl Seeman. Some of the finest mono piano recordings I have ever heard came from the Westminster label with pianists such as Egon Petri, Paul Badura-Skoda, Raymond Lewenthal and some others. Taking into account that a concert grand is only nine feet in length (usually, some are a bit longer), it is not like recording a full symphony orchestra spread across the entire stage where stereo provides its greatest effects. What stereo does for a piano is to give it more "air". It is tantamount to listening to a piano with one ear; when using both ears, we, of course, get a much more natural, lucid sound. Think, for example, of listening to Beethoven's 32 recorded in the days of 78s. His Bechstein piano is heard with a lovely, singing tone, but never overly bright tone. I never mind listening to mono piano recordings if that was the way they were originally recorded. You're my hero, Lance I want to get it, but am not sure if there are enough hours left of my life to get to everything! I'm going to sit back and see if the price goes down to $140 or so. Of course my wallet will hardly notice the difference, but if I feel it is a steal, I'll feel less guilty about adding more disks to my jam-packed collection. But congrats to you on a fine purchase! Thank you, thank you! Yes, this is a magnificent tribute to Arrau. Universal/Decca has done the pianist well with this edition and it is quite a tribute to him. I doubt if the price will go down to $140/USD, but even at the current price, I note that prices on these mega-boxes usually goes up. Arrau is a major artist and no doubt this set will sell very well. Most of us have many of his LPs and CDs already issued, or at least the items that interest us, so there will be some duplication of repertoire. The price per CD is extremely decent. I wondered about the Brendel Edition, too, but finally ended up getting that as well. With Arrau, you may want to investigate his EMI/Warner Icon box as well, not to mention what RCA has put out. Please let me know how you make out with your decisions. I have finally managed to manifest this entire set into my computer. Big job but what an accomplishment! They way the set is arranged, however, makes it easy to group things together in cataloging the set. It is now easier than ever to pull all the individual singles and sets and maybe dispose of them by selling to others who do not want nor need the entire new set. I have never sold on Amazon or eBay. I wonder just how complicated and time-consuming that is? I sold a couple of sets on EBAY. Amazon eliminated their system for "casual" sellers (or maybe they just kicked me out?). You may want to wait a while til it is OOP, and see if you can recoup your whole investment. The Similarly organized Rubinstein box was selling for several hundred dollars. Listing it doesn't take long, but packaging it and standing in line at the post office is a pain in the neck. The reason I thought the price might go way down is I bought the Rubinstein for $120 and two of the Perahia boxes (for friends) at $65 (I paid $175 for my own Perahia, when it was "Fresh"), and about $100 for the Yo Yo Ma. I will definitely pass on the Brendel, as I have his VOX set of 35 disks (which was almost free), and am satisfied with that. Please don't pass up the opportunity to acquire the complete Brendel set on Phillips. It's a whole other, vastly superior world from the Vox set! I own both, and must say that Brendel's early efforts are quite inferior (except for his Schubert) to his later recordings. Brendel himself repudiated the Vox discs in general, and, although I grew up with them, I must agree. He evolved spectacularly as an artist, as his later recordings show. I, for one, would not be without them. I second Brian on Brendel. Superb pianist, always interesting and often much more.